Ø Investor Concern: Investors are concerned these days that although the markets are rising and touching new highs frequently, their investments in mutual funds (MFs) are not rising proportionately. In the last six to seven months, the SENSEX 30 navigated between a high of 36,283 on 29 Jan 18 to an all-time high of 37,606 on 31 Jul 18. The ebb came when it touched 32,596 to hit its low point on 23 Mar 18. Similarly, the NIFTY 50 traversed between its record high of 11,171 on 29 Jan 18 to an all-time high of 11,360 on 03 Aug 18 with the low point on 23 Mar of 9,998. The reasons are explained in the subsequent paragraphs. Average Returns: As on 20 Jul 18, equity large cap had generated a negative average return during the last six months of -1.85%. The multi cap generated -4.96%, whereas the mid-cap generated -10.65% and a small cap of -17.44%. Equity sector (technology) generated the best returns at 13.48% followed by debt funds at about 3 to 3.5%. The worst performer was the equity sector (infrastructure) that generated negative returns of -18.71%. 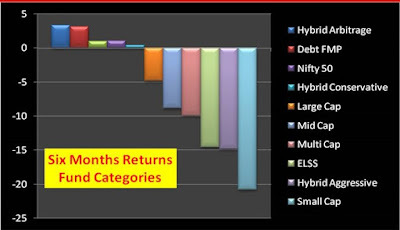 Given below is the chart indicating the six months (Jan to Jun 18) returns of various fund categories as per Value Research. Market Performance: In the last three months, 26 out of 30 large cap MF schemes underperformed their benchmark. In fact, only 3 to 7 big companies are driving the market and their market caps are zooming to new highs. About 60% of the NIFTY 50 constituent stocks are in the red. Only 19 stocks in the Nifty outperformed the index with positive returns. 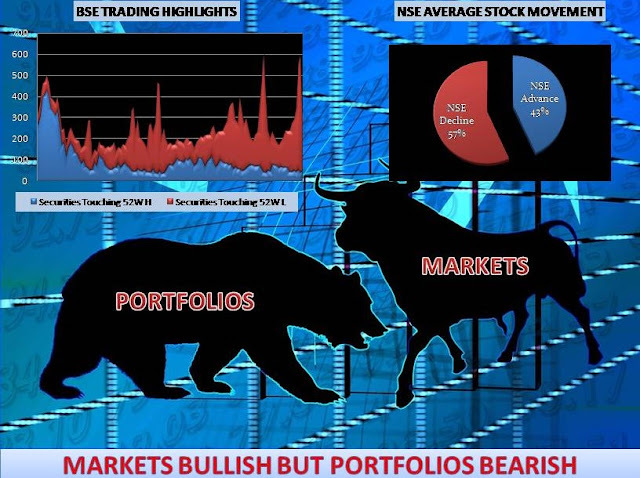 31 stocks, comprising more than 50 percent of the Nifty, underperformed the index. The poor conditions of the banking sector due to their large NPAs and unbelievable frauds have dipped their stocks to the bottom 10 of the list. The mid and small cap stocks dropped between 20 to 50 percent with some companies going down by almost 80 to 90 percent. Corrections in the mid and small cap space are primarily attributable to the mismatch between earnings and valuations. The stocks in the mid and small cap section had premium valuations that their earnings could not support. So their dream run of last two years started crashing after the Budget 2018. In the Nifty, only 27 percent of mid-cap and 19 percent of small-cap stocks delivered positive returns. Advance Decline Ratio: The advance-decline ratio is a popular market-breadth indicator used in technical analysis. It compares the number of stocks that closed higher against the number of stocks that closed lower. 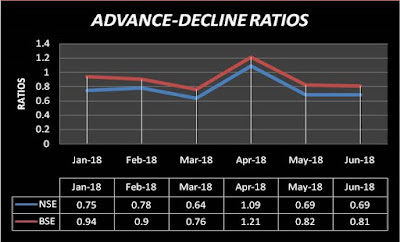 If we compare the total stocks that advanced or declined at the two bourses over the last six months, we realize that the ratio has crossed 1 only in April. This indicates that in the other five months, more stocks have declined at these bourses than advanced. Tightening of Regulatory Process: The other major contributory reason to the poor performance is the recently implemented SEBI guideline to re-categorize and rationalize the MFs into five broad categories, viz. equity schemes, debt schemes, hybrid schemes, solution-oriented schemes, and other schemes. Along with this, SEBI also redefined the market capitalization norms for the large, mid and small cap companies resulting in the eligibility of the first 100 companies only for large cap. Although this will help the investors in the long term, it has severely constrained the fund managers in the near and short term by reducing their flexibility to decide the market cap norms and switch funds to generate better alpha. Besides, SEBI has mandated all equity schemes to benchmark their performance against a total returns index (TRI), which are calculated after adding the dividends of the underlying companies. Effectively, these results in raising the hurdle for fund managers as the return of TRI indices are typically 1.5-2.5 percent higher than regular indices. Moreover, SEBI has also cracked down on MF Houses who were breaking the norms by investing outside the scheme’s mandate to generate higher returns. Other Reasons: The other reason is the global headwinds generated by the likelihood of trade wars and Fed tightening. The market outflows by FIIs due to falling rupee have adversely impacted the sentiments, which the domestic investors mitigated to a large extent through their sizable inflows. At the national level, FY 2018-19 is governed by eight assembly polls followed by general elections in 2019. The investors are advised to maintain their calm and should not prematurely churn their portfolios or exit from underperforming schemes. The market cycle auto corrected such dichotomous market situations on its own. Stay invested in equity MFs while maintaining a long term investment horizon and continuing the existing SIP. The market cycle will auto correct after the political and global headwinds. Watch the performance of hybrid funds over the next two quarters since they may stabilize after the turmoil created by the new SEBI regulatory order forcing mergers and fundamental change of attributes. Park your funds in short duration debt funds or FMPs to negate the market volatility and generate better returns than fixed return instruments.